The 1976 Bicentennial Boston Sea Rovers. 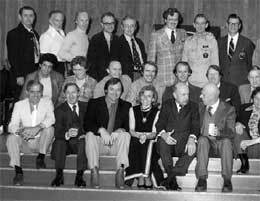 Front Row (L to R): Don DeSantis, Frank Scalli, Al Giddings, Sylvia Earle, Luis Marden, George Benjamin, Bob Newberry, John Ames, Tony Salerno. Second Row: David Doubilet, Ruth Dugan, Joe Hohmann, Andy Barrs, Bob Ballard, Peter Besgen, Joe Linehan, Walter Hornberger, Ray Oteri. Standing: Ed Hayes, Walt Hendrick, Joe MacInnis, Glen Reem, Jerry O'Neill, Don Hunter, Bunky Hodge, Boll Carmichael, Walter Feinberg, Bob Price, Lenny Pinaud. (from B. Hodge). In the 1970’s, dive travel was starting to emerge as a hot topic, and most of the newest resort destinations were being premiered and featured at Clinics. Sea Rover audiences traveled around the globe without leaving Boston, as speakers came from all over to introduce us to their fantastic diving, and fascinating marine life. Diving also started to become more organized, as national training organizations united with dive industry leaders to promote national certification standards, and self-regulation. 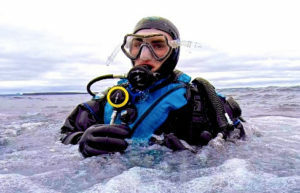 The Sea Rovers have always been a proponent of safe diving, and provided ample speaking platforms for diving educators to share any new techniques and methods that would improve diver skills. “There have been some very, very good times spent on expeditions with Rovers, probably starting with Loch Ness. Sam Raymond went over and helped us set up the Benthos cameras for the first time as we tried to figure out how to bait the Loch Ness monster underwater into the National Geographic’s cameras, and I still remember with great fondness everything we did. On this trip, Doc Edgerton was on the project doing sonar, and Bob Rines had a remote camera.